← Do you think your wife knows everything? Aluminum Hard Anodizing Industry today comprises a number of different hard anodizing processes starting with the High-Voltage (HV) DC processes and ending with diversity of Low-Voltage (LV) processes. Some Low Voltage (LV) processes (Sanford Plus “S+” & Sanford Quantum “Q”) differ from the HV-processes by adding AC current of industrial frequency to DC current in order to electrically eliminate polarization of the electrodes (a build-up of gaseous shirts of oxygen and hydrogen on the anode and cathode respectively). Elimination of polarization brought about drastic diminishing of the DC voltage needed to conduct the process (the final voltage in the HV process can reach 60 – 75 V and more, whereas in the LV process the DC voltage component does not ordinarily exceed 20V of the end of the process (“S+) and can be as low as 11.5 – 13 VDC (“Q”). The lower DC voltage means proportionally lower power consumption during the process of anodizing in the tank and therefore lower power consumption of the cooling system maintaining the electrolyte temperature. Let us take into consideration that more than 90% of the power generated by the current flowing through the tank is dissipated as heat in the oxide film. So, if 1000A flows through 20 sq. ft. at say 70V it means that 63kW = 1000A x 70V x .9 is dissipated (or more than 3kW per sq. ft. in the film). At 20V DC heat generation at the same current level drops to less than 1kW per sq. ft., which creates more favorable conditions for the oxide film to grow more uniform and harder without local spots of overheating. There is another important consideration which makes low-voltage coatings superior to high-voltage coatings. If you scan the cross-section of the coating you will see a more uniform structure. (See Photo # 1 with a cross section of Sanford + Plus Process). Better uniformity is due to a phenomenon which is inherent to aluminum oxide formed in sulphuric acid solutions. 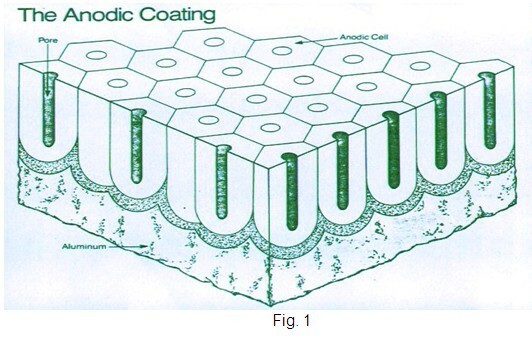 The oxide film, as is well known, has a cellular hexagonal structure and every cell has a pore in the center aimed in the direction towards the aluminum surface (see Fig.1). The distance between pores is proportional to the applied voltage. This means that when the voltage increases the number of pores per unit area decreases. In the HV process 20 to 25V DC is applied at the beginning of the process and then the voltage is raised at the rate of 0.75 to 1.5V per minute until the final voltage, at the level of 60 – 70V and more, is reached. Then the voltage does not change during the dwell period and the structure of the coating is the same. The bulk of the coating is normally formed during the time before dwell starts and the coating is extremely irregular. During the dwell period only an insignificant portion of the coating thickness is created. In the LV-process the situation is opposite. After the process starts, 12V DC is reached during the first 5 minutes in Q process and stays almost the same to the end of process. In S+ process the voltage is increased at the same rate as in the HV-process but the final voltage (which is 18 or 20V DC) is reached very soon, leaving the bulk of the film to be formed during the dwell period. 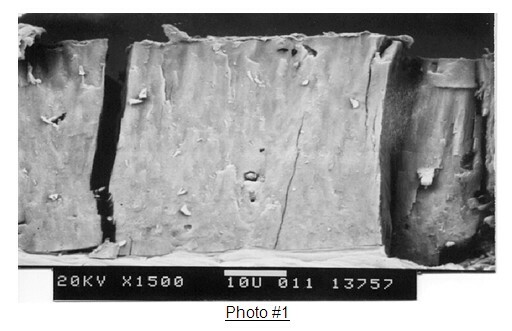 That is why the main portion of the coating is formed at the same voltage and has the same number of pores (see Fig.1). Hard anodizing have different colors depending on coating thickness, type of aluminum alloy, electrolyte temperatures, anodizing voltage, current density and other more or less significant factors. What is the physics of color differences? Different colors can be explained by different degrees of reflection and absorption of sunlight components by oxide films and the aluminum surface. White light has different components which can create a spectrum of colors either naturally (rainbow) or in a laboratory with the help of diffraction or dispersion. If the oxide film does not absorb any component of light and all components are evenly reflected by the aluminum surface then the film looks colorless (white). If oxide film absorbs all components of light without discrimination then the film looks black. If a specific component of light is absorbed better than others, then the combination of reflected components without the absorbed one will create a non-white color. Pure aluminum oxide A1203 is colorless in bulk form. Aluminum oxide formed on the surface of aluminum by anodizing in sulphuric acid solutions is contaminated by atoms of alloying elements to say nothing about the presence of excessive aluminum atoms in the oxide structure, having also the capacity of absorbing light. The excess of aluminum atoms in the film is created when the conditions of anodizing obstructs the easy flow of oxygen in the direction towards the aluminum surface through the oxide film, providing, however, an ample supply of aluminum. For instance, lowering the electrolyte temperature or increasing the anodizing current density will make the films darker even though the thickness remains the same. Even rather pure aluminum alloys belonging to 1100 series may be very dark at a thickness of 2 mils (50 microns) when hard anodized at 32° F (0° C). Another factor, besides contamination by aluminum atoms, which contributes to forming dark color, is the pore structure of the aluminum oxide. HV hard anodizing produces rather complex and intricate pore structures, as was discussed above in this paper. That is why the HV-coatings are darker than the coatings of the some thickness, but with a more regular and uniform pore structure, which are obtained in Low-Voltage hard anodizing at the same temperature. On the other hand, the thicker the coating in LV processes, the darker the color, which means that the thicker LV-coatings with a uniform pore structure can develop about the same color as thinner HV-coatings. 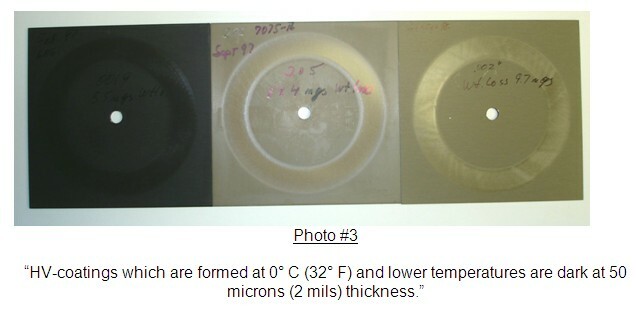 As a rule all HV-coatings which are formed at 0° C (32° F) and lower temperatures are dark at 2 mils (50 microns) thickness. It is impossible to conduct the HV process at higher temperatures in shop conditions without danger of burning the parts. In the LV processes temperatures can be safely increased up to room temperature without danger of burning the parts and we can observe how the 2 mils (50 microns) oxide film becomes gradually lighter due to the diminishing of the number on non-bound atoms of aluminum in the oxide structure. At room temperature oxide films on pure alloys becomes transparent and close to the color of natural aluminum oxide. In spite of having a color as light as in conventional anodizing, the 2 mils (50 micron) thick LV- hard anodizing made at room temperature is as hard as the low-temperature hard anodizing. Normally, we do not recommend using the room temperature, LV-hard anodizing process to form coatings thicker than 2 – 2.5 mils (50-62.5 microns), however, on some alloys, like 1000, 5000 series, it is possible to form very hard 4 – 5 mil (100-125 microns) coatings at room temperature. For all other alloys a LV-process at 40 – 50 ° F (4.8 – 10°C) is recommended in order to get hard thick coatings. We have so far been considering colors of 2 mil (50 microns) coatings which are standard for the industry. Increasing thickness over two mils does not necessarily make the color darker. It is well known for the HV-process that especially for 2000 series alloys the increase of coating thickness over 2.5 mils (62.5 microns) is followed by lightening of color and softening of the coating. Microscopic investigations show that isles of soft aluminum hydroxide are created in the coating and they can be easily pierced through by a needle point. It may happen due to the prolonged stay in the sulphuric acid solution as well as due to high heat generation in the oxide film. Having in mind this phenomenon a rule was accepted in the industry decades ago: “the darker the coating, the harder it is”. When hard anodizing were formed only by high voltage this rule implied that a 2 mils (50 microns) recoating is dark and therefore hard, but when the thickness would increase to 3 – 3.5 mils (75 – 87.5 microns) the coating becomes lighter and therefore softer. If a 2 mil (50 microns) coating is light then it is no good. When the low-voltage hard coating processes were introduced the rule became ambiguous, because a light color two-mil LV- hard anodizing is not soft, it is hard and even harder than HV-hard anodizing of the same thickness on the same aluminum alloy. With regard to 2 – 3 mil (50 – 75 microns) coatings the rule must be changed to not necessarily lighter coatings are softer. 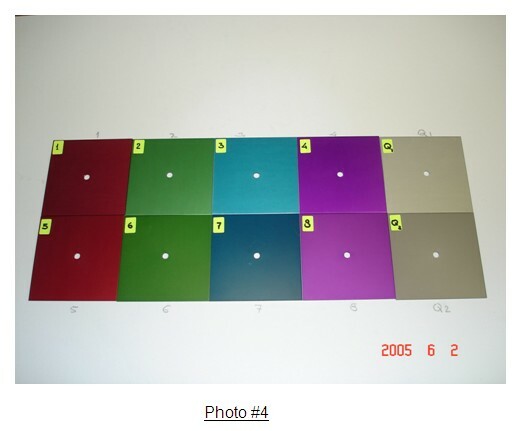 Since the room temperature hard anodizing produces transparent films close to the color of natural aluminum oxide, it is possible to observe the contribution of different alloying elements to coloring of the film. High copper alloys (2000 series) show gray color (Code 36555) at 1 mil (25 microns) thickness and light brown (Code 30266) at 1.6 mil (40 microns). High Zinc alloys (7000 series) show: gray color (Code 36555) at 1.5 mil (37.5 microns) thickness and green (Code 34258) at 2 mils (50 microns). Other alloying elements provide different shades of gray color. We discussed integral colorings of hard anodizing which starts with thicknesses exceeding 1 – 1.5 mils (25 – 35 microns). Hard anodizing less than 1 mil (25 microns) are essentially transparent irrespective of whether HV or LV process was used. The difference is, however, that HV coatings are less porous and therefore they do not accept dyes as readily as conventionally anodized soft coatings or LV hard anodizing. LV coatings provide an option of successful dyeing of much thicker coatings like 1.5 mil (37.5 microns) and even 2 mils (50 microns), demonstrating the same bright colors which ordinarily were achieved only through soft conventional anodizing. Of course dyeing and sealing performed in heated tanks softens coatings so that they can not ordinarily pass the abrasion resistance test, but they are still much harder than soft conventionally anodized films. This opens a wide range of possible applications. 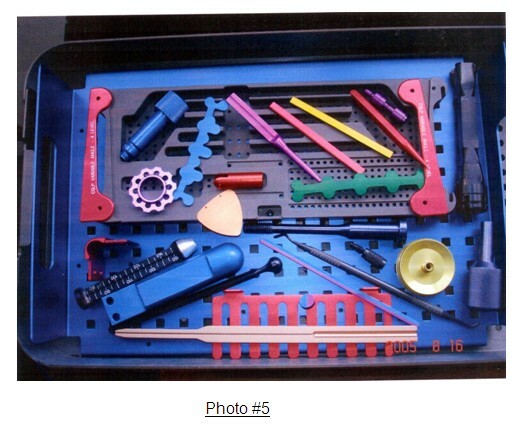 This entry was posted in Aluminum Anodizing - Type III. Bookmark the permalink.